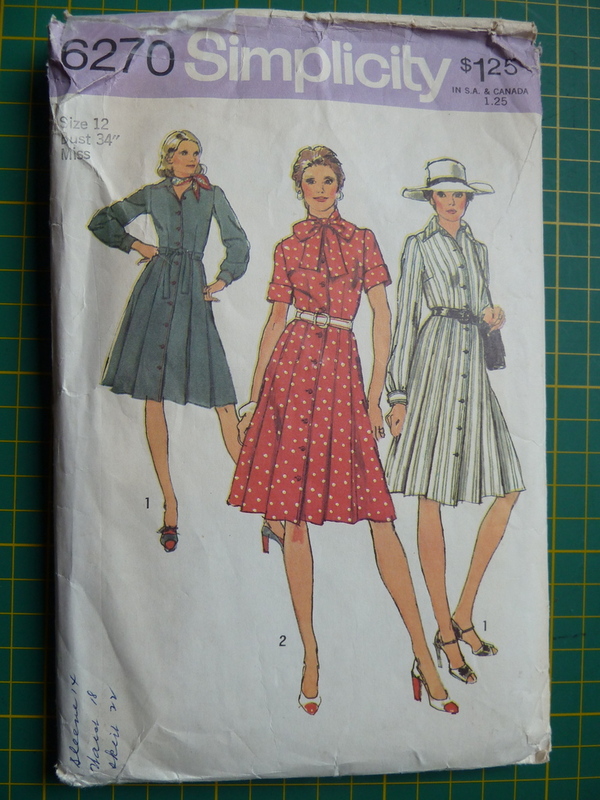 Posted on November 4, 2012 June 21, 2018 by catherinedaze	This entry was posted in dressmaking, Finished, sewing, Simplicity, Vintage and tagged dressmaking, sewing, shirtdress, simplicity, vintage. Bookmark the permalink. I love the shorter length. Makes this dress look really fresh. Another great dress Catherine. I love the styling which makes it look very contemporary. Do you find the cotton warm enough for work? I always worry that I’ll be cold unless I have lots of layers on but perhaps you are hardier than me. Thanks! I wear a long sleeved t-shirt and a slip underneath and that works ok.
Ooooh, I love this Catherine! Particularly the pleated front, so cool and wearable and flattering. Lovely!!! Yes, I’m with Pendle on the length- it really brings it a new modern feel. I like the pleats, too. Almost unexpected. Nice! It really turned out great! I am a huge fan of shirtdresses also. Great dress! I love the belt and boots worn with it. Great dress! 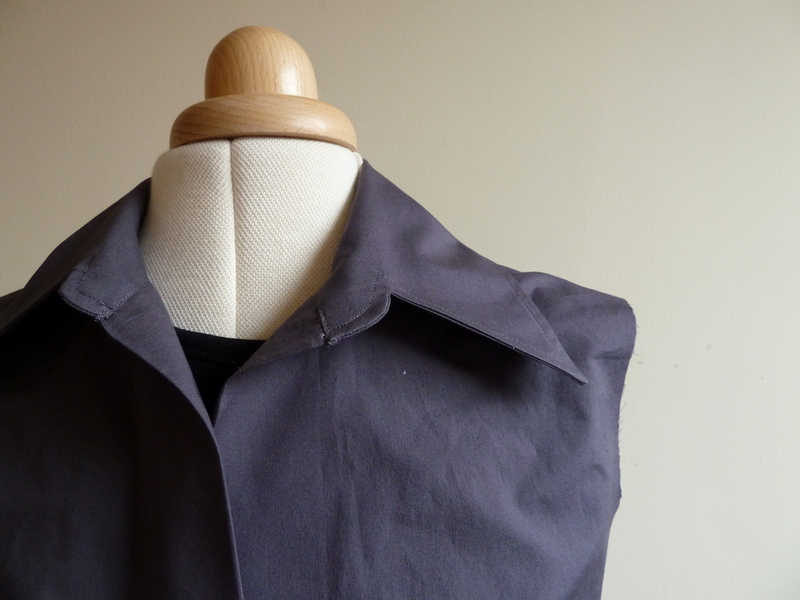 I love that dramatic 70s collar and the pleats (so crisp!). Totally cute! The pleats are great. What about a large scale print? By shortening this you made vintage modern! Love this on you! great, and I like the shape of that pleated skirt. What a great dress! I love the pleats in the skirt. And I hear you about one-piece collars. I, too, prefer collars with a separate stand – they just seem to sit better. That looks fantastic. And the boots!! An the belt!! You’ve styled it really well. I love it on you. I love this dress! It’s such a great color and I love the way you’ve styled it–casual but still very smart. You look amazing in it too! Did I mention, it’s a great dress? Awesome as usual and totally agreeing with you on the length thing.Also those inverted pleats are cool. I’ve been dreaming of shirt dresses for a while now but it’s been too cold. Must get on to it. I haven;t seen a pleated skirt shirt dress yet, and I really like how the skirt is only pleated at the front, that solves the sitting issues, I always crumple the back of my skirts at work. The shorter length is infinity more flattering and modern. Very nice dress! Intresting collar – never saw such one! Nice dress! The pattern doesn’t inspire, but made up the pleats come into their own. edge of the slash and stitch it down. I don’t know of that’s the only way to do it but it wasn’t as fiddly as it sounded. Good luck! Love this! The skirt is so cute. Great dress and I love the tan belt with it. Wow, what a great dress! I loved the way you styled it! 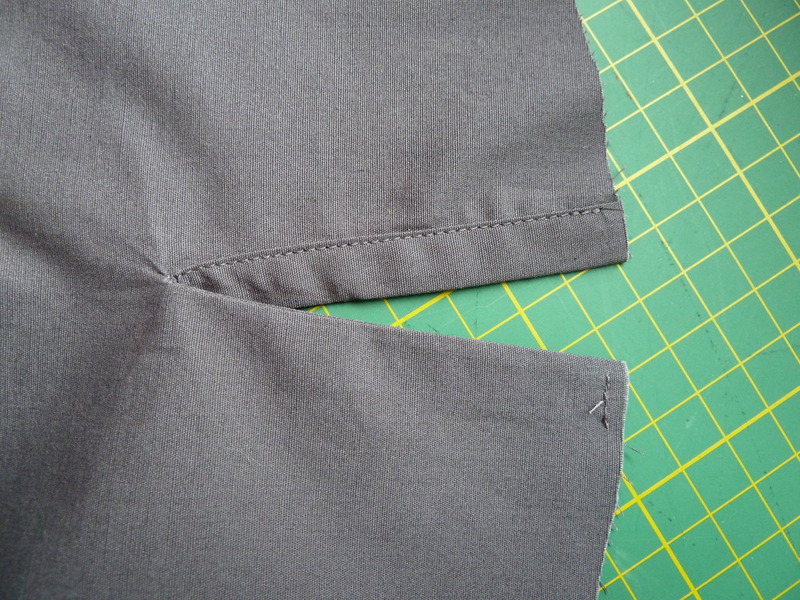 The sleeve binding is perfect…a very standard and simple placket installation. Looks good!